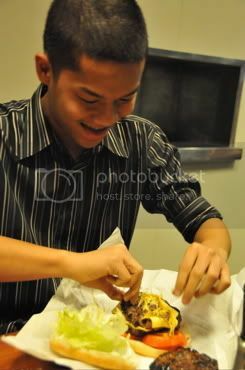 if ever anyone asks me: pa-burger ka naman, i'd probably reply, if you could finish a burger in 5 minutes, most certainly! that doesn't sound very hard, except that i have a specific burger in mind. and not just a regular mcdonald's big mac. not even a quarter pounder. more like triple decker from burger avenue. 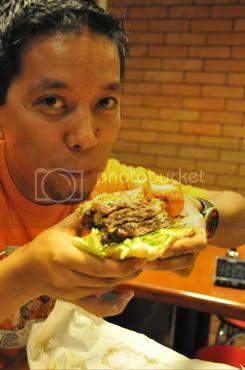 last friday, i treated karl to a ridiculous burger from this new burger place at the a. venue along makati avenue (doesn't that just annoy you to have to say the same word three times in one sentence? ), with the condition of course that he wolf it down in 5 minutes. burger avenue has this ridiculous challenge where they'll refund you the cost of the burger if you finish it within the alloted time. and if you have 3 flame-broiled quarter pounders, a slice of cheese, tomatoes, and lettuce bunched up between two buns, eating the burger becomes a burden, and certainly far from pleasurable. i was the first to attempt the challenge. 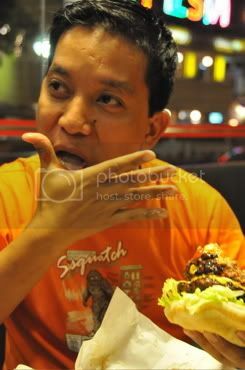 i kept biting off more than i could chew, and before long, i had so much masticated beef in my mouth i couldn't swallow! and i absolutely did not feel the burger. it didn't go through to my stomach, because although the burger was huge (biggest i've had ever) -- so huge that i couldn't even bite it from top to bottom -- i felt empty immediately after i finished it. it was almost like i hadn't eaten much at all. but so did i get a refund of my P224? no. i'm not so gluttonous (i.e., patay gutom) as i thought, and i still had 1/4 of a patty and one whole tomato when the time expired. plus my mouth was already filled to bursting. 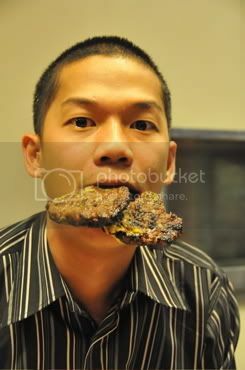 karl didn't fare any better, as he had two whole patties to go after 5 minutes. burgers avenue displays photos of everyone who's ever won the challenge (standing record is 1 minute and 30 seconds they say), and there are quite a lot of winners already, but it isn't as easy as one might think. it's a chore, almost, to have to eat it under time pressure, when in all likelihood, it could be shared by as many as 4 people! 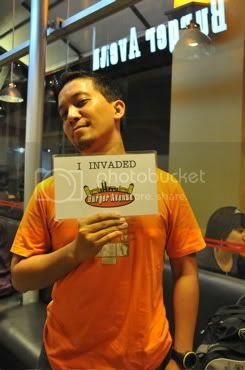 i must say though that the challenge prevented me from truly appreciating the burger. it was actually really good. juicy, tasty, and much healthier too, being flame-broiled too. 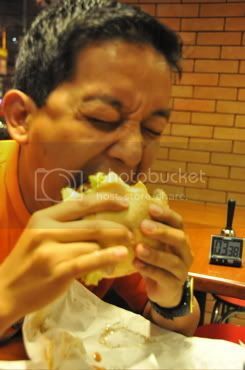 on a less adventurous day, i would probably go back to burger avenue, order that ridiculous burger, and relish each bite, each act of mastication, and just enjoy, with absolutely no pressure.